Capping off a week of strikes and protests by garment workers demanding a doubling of the sector’s monthly minimum wage to $160, military police shot dead five and wounded more than 20 outside a Phnom Penh factory on Friday. Condemned by human rights groups, the U.N. and foreign governments, GMAC Secretary-General Ken Loo on Sunday said the military police’s lethal response to the stone-throwers was “absolutely” appropriate. 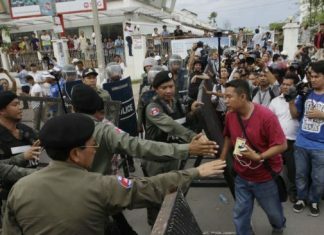 At a press conference at the Phnom Penh Hotel on Monday to justify its staunch rejection of the striking workers wage demand, and to call for an end to the strike, GMAC chairman Van Sou Ieng roundly condoned the military police killings, and blamed the deaths on the strikers themselves. “Proportional is your evaluation, each one evaluates,” he said of the military police’s firing of live rounds at stone-throwers. GMAC did show reporters a brief video clip of garment workers kicking and punching a metal factory gate, but inflicting no actual damage. Unable to speak to the alleged damage to factories, Mr. Sou Ieng was more precise in putting a price tag on what the strike stoppage had cost factories in his association and their industry: $200 million lost in sales and $70 million in revenue over the past 50 days; an untold number of buyers threatening to sue or cancel contracts over lost production; and five to seven firms that were thinking of setting up shop here canceling visits. As for 2014, he said some brands such as H&M have agreed to pay more for their orders but warned that an overall—and dramatic—drop in orders was already guaranteed. But, Mr. Sou Ieng and the rest of the pro-business panel at the press conference insisted that garment workers were paid enough, and that doubling the minimum wage would not only kill the local garment industry but wreak havoc on the whole economy. Bretton Sciaroni, a longtime legal adviser to Prime Minister Hun Sen’s government who chairs the country’s International Business Club, warned that suddenly doubling the minimum wage in a sector that employs some 600,000 Cambodians would have a dangerous inflationary effect countrywide. Mr. Sciaroni said he did not know at what wage factories would start to pull out—what he called the “tipping point”—but insisted that more protests like the ones Phnom Penh saw last week would deter more from coming. Local human resources company HR Inc. conducted a survey of garment worker earnings and expenses in mid-2013. It found that the average production floor worker was earning, with daily overtime, just shy of $178 dollars a month and had money to spare even after sending $56 dollars home each month. “Of course there is a debate about what is good food,” said HR Inc. managing director Sandra D’Amico, who also serves as vice president of the Cambodian Federation of Employers and Business Associations. “But the reality shows there is extra money and there is disposable income,” she added. GMAC’s Mr. Sou Ieng also claimed that a relative minority of strikers was holding the entire industry hostage. He did not accept the striking unions’ call to resume wage negotiations but said any future talks would have to take place free of any more violence. Mr. Sou Ieng said he also expected at least 80 percent of garment workers to head back to the country’s 400-plus factories after today’s January 7 national holiday. For their part, the six unions behind the protests have consistently denied inciting any of the past week’s violence and on Monday said they were standing by their demand for a $160 minimum wage. Chea Mony, president of the Free Trade Union of Workers of the Kingdom of Cambodia, had his own warning for the factories—that if they did not double the minimum wage workers would leave the country to seek better wages abroad. “I want to warn them that if there is no increase of the minimum wage the industry will collapse because the workers will migrate to other countries,” Mr. Mony said, and dismissed the factories’ warnings of pulling out of Cambodia as a tried and tired tactic. “Let them increase to $160 first so we can see how many factories close. They have talked about this for 10 years already,” he said. Mr. Mony said the six unions had not yet settled on their plans after today’s holiday but expected many—he did not say how many—workers to keep striking on their own. Kong Athit, vice president of the Coalition of Cambodian Apparel Workers Democratic Union, said the factories should prove they could not afford a $160 minimum wage by opening up their books. “The important thing is that they have to return to the negotiating table. We still demand $160,” he said. The unions have rejected an offer by the government and factories to raise the minimum monthly wage to $100.